When the first wave of Italian immigrants came to America around 1900, they unintentionally made their own unique traditions, one such tradition is Sunday Gravy. Sunday Gravy has become something of an enigma, a cultural phenomenon. It’s engrained in the life of Italian-Americans and a distinct part of the culture. The first wave of Italian immigrants began to arrive around 1880 with most arriving between 1900-1914. The port of entry was Ellis Island, the Statue of Liberty a symbol of a country welcoming them with open arms. The Italians immigrants worked long and hard. Days were long and money tight; weekends were the only time they had to spend with their families. Saturday’s were mostly spent at the markets and doing chores. Sunday’s were for church and family and dinner was the best chance they could spend together before the week began. Food, and particularly Sunday macaroni and gravy had become a staple and eventually a tradition. Today, it’s legacy grounds us and helps bring families back together. Sunday gravy is pretty close to a Napoleon Pork Ragú Pasta Sauce. A typical ragú from Southern Italy usually started with ‘the slow braising of pork neck-bones and sausages.’ These were meats that were considered left-over and inexpensive cuts but also had the most flavor. 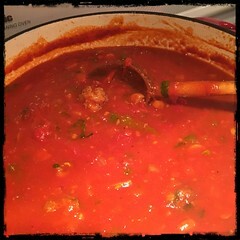 Meatballs and brasciola (rolled, stuffed and seasoned steak) were added to the Ragu later on in the process. An interesting story that my grandma told me about adding hard-boiled eggs to the gravy. During the Great Depression in 1929, hard-boiled eggs were added to the gravy because there wasn’t enough meat for everyone. This also became so popular that it’s still enjoyed today by many descendants. This recipe is an interpretation of my grandmother’s tomato, braised-pork ragù. The key ingredients are the pork neck bones, Italian fennel pork sausages, beef meatballs, pecorino Romano cheese, fresh basil and fennel seeds. Beef braciole was a treat, added when we had the beef-steaks. Sunday gravy can be used with any type of pasta such as spaghettini, rigatoni, penne rigate, fusilli or ravioli. Typically a ragu uses ground meats and a sugo uses braised meats cooked relatively slow. A sauce, or salsa, doesn’t usually use ground or braised meat but is based on simple and only a few ingredients. 1. In a large dutch oven, preheat 3-4 tbsp of olive oil using medium heat. Add the pork neck bones and sausages, cook until the they’re golden brown on all sides. After the meat is browned, set aside. 2. After you have removed the pork toss in the cut up pancetta and let cook for a few minutes, do not cook too brown. 3. Once the pancetta has rendered down and begins to brown add the chopped onions, garlic and crushed peperoncino fiocchi (hot pepper flakes). Let cook and keep an eye so not to burn the garlic. 4. Once the onions, garlic and hot pepper flakes are done, add the peppers (green and red). Cook for another 5 or 10 minutes more or until the peppers soften. 5. Add a cup of Italian red wine and let come to boil, then add a cup of beef stock, let come to a boil and then a cup of chicken stock (let come to a boil). 5. If you like you can add mushrooms. 6. Once the vegetables are done, add the hand-crushed plum tomatoes and the two cans of tomato paste. Bring to boil and add the broth (beef and/or chicken) 1 cup at a time, stirring frequently. 7. Simmer the gravy until it begins to bubble slightly. Add the salt, pepper, fennel seeds and bay leaves. Then add the Romano cheese, mix well and let simmer for another 5-10 minutes, stirring frequently. 8. Finally add the fresh basil and freshly squeezed lemon juice. 9. Return the previously set aside meat to the gravy, cook for an 30-60 minutes, stirring frequently (or longer, if you like). If the gravy becomes too intense you can add water and some more hand crushed tomatoes. Just let simmer an additional hour if you do. 7. You could add other precooked meats such as meatballs and/or braciole to the sauce, it adds flavor. Another tradition is to add hard-boiled eggs (shells removed) when serving the pasta and sauce. This was something my grandmother learned during the great depression when there wasn’t enough meat for everyone.